Hello! 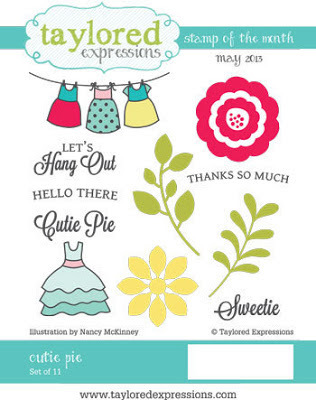 Today I have a card using the Taylored Expressions May Stamp of the Month, Cutie Pie. I also used the TE May Key Ingredients which is a perfect match with the SOTM! All cardstock, patterned paper (from the Echo Park Sweet Girl collection) and ribbon are included in the May Key Ingredients. For more information about the Stamp of the Month, Key Ingredients and Deluxe Subscription (includes SOTM and Key Ingredients, please visit Taylor's blog HERE. To sign up for any of these, please see the subscriptions page on the TE website HERE. Accessories: Taylored Dies: Labels Stacklets 2 (Taylored Expressions), Markers (Copic), Ribbon (from May Key Ingredients), Snow Pearls (Kaisercraft), White satin sequins, Foam tape, Thread, Sewing machine. 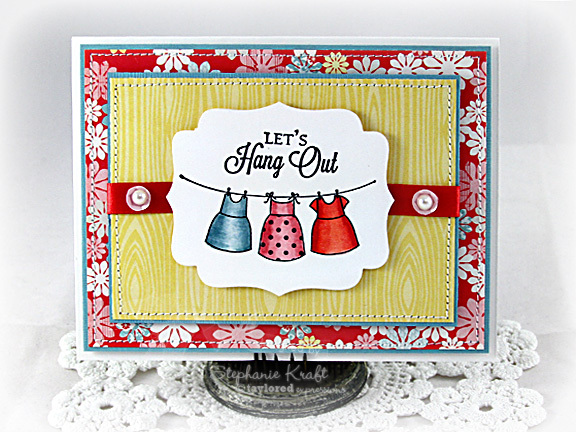 Adorable card, Stephanie, I love how you colored the dresses! So pretty! This is seriously one of the cutest cards I've ever seen!! You are amazing!! Cute card Stephanie! Love the sweet little dresses!